Develop Show – You take one of the face up show cards from the center of the table. There may be prerequisites (stars and/or ads) that must go with the show – you must have the necessary prerequisites to take a show card. There is also a development cost in the upper left that must be paid in order to take the show. Place the show in one of your three time slots – though you should note that each show has a preferred time slot – and place any prerequisite ads and stars, splayed underneath (be sure to look at the conditions for the ads and stars – if you meet certain conditions, you will be able to display the more valuable side of these cards). The old show in that time slot is moved to your reruns area (and ads and stars with that older card are discarded). Place a cube on the top row of the show to show how many viewers that show will get this turn. Finally, check to see if this newly placed show is the third or fifth show in a particular genre (denoted by an icon in the upper left corner) – if so, you will get groovy bonuses. You are limited to three active shows at any time (one for each of your timeslots); each time that you get a new show, you move an old show to the Reruns area. Sign Star – You may take one of the face up Star cards from the display and add it to your green room. There is no limit to the number of Stars that you can hold onto. You must pay the signing cost for the Star card when you acquire it. Star cards have no effect until they are played with a show. Land Ad – You may take one of the face up Ad cards from the display and add it to your green room. There is no limit to the number of Ads that you can hold onto. You receive money for the landing bonus of the Ad card. Ad cards have no effect until they are played with a show. Take a Network Card – There are four kinds of Network cards, and each of them gives the owner a special ability. Some are immediate use upon acquisition, some give a one-time special power, some provide end game bonuses, and some give lasting effects. Attach a Star/Ad – You can take one of the Ad or Star cards which is in your Green Room area and attach it to a show in your lineup. If the show has prerequisites, those limitations must still be met. You may need to discard an existing Ad/Star on that show to stay within the limits. Drop and Budget – This is where you drop out of the round. Move your player marker onto the passing track on the board. You can take your pick of a reward: either money or Viewers (VPs) – but note that you do not get both! The rewards are higher for the players who drop out earlier. If you are the last person to drop out, the round will end after that action. Once all players have dropped out, there is an end of round sequence. First, you have to calculate your cash flow. Active Ads will provide you income, and some of your shows and stars will have upkeep costs. Total that all up and then gain/pay the result. If you end up owing money, pay from your supply – and if you do not have enough money, you lose viewers instead! Second, calculate your viewers for the season. Look at your three shows, and see how many viewers watch (based on where the black cube is on the card). Remember that some shows get a higher viewer count if they are in their preferred time slot. Don’t forget to add in the viewers from Stars and Ads if applicable. There is a toteboard on your player board to help you keep a running total to yourself. Finally, add in the viewers for your re-runs. Now, it’s time to age your shows. The black cube moves one slot down for each of your three active shows. If the cube is at the bottom slot, it just stays there. Finally, you set up for the next season (unless you have finished round 5 – at which point, you’d just move to end game scoring). First, all your re-runs are placed in the archives section. These shows will no longer generate viewers in scoring, but they will still count toward the genre bonuses (for having 3 and 5 of a type). Second, discard all unused cards. Then, refer to the reference on the central board for how many cards of each type to deal out to the table. Turn order for the next turn is determined in reverse order of viewers (VPs); ties go to the player who dropped out earlier in the previous turn. After the fifth round (and fifth scoring), there is a bit of end game scoring. You score your three active shows one final time – remember, that they have aged since the Round 5 scoring that has just finished. There are no re-runs at this time as they should all the in the Archives. You also score one point for each Star card in your Green Room. Finally, score any end-game Network cards that you have. The player with the most points wins. If there is a tie, the player with most money left wins. I’ve now had the chance to play the game a number of times, and I have become more enamored with the game with each successive playing. The theme of the game is appealing to me, and all of the cards help reinforce it. While it is obviously a bit simplistic to think that a TV network only has one night of programming to worry about – The Networks definitely gives you the feel that you are in charge of a network’s programming. The main action in the game is taking cards from the center display and adding them to your Network area – but there is much more to the game than just choosing which card you want. The display is only refilled at the start of each round – so you have to survey the entire selection at the start of each round to come up with a coherent plan. Different cards will have different relative values to each player (depending on what they already have or what they need), and early in the round, there will be many cards that you will want to pick up – and the job is to figure out which cards need to be taken early and which cards will hopefully still be available when your turn comes back up. While the show cards seem the most vital – as they provide the bulk of your victory points – you must have the prerequisite stars or ads in order to take those shows. There are times when it seems worth staying in a previous round picking up any leftover stars or ads in order to put you in a position to be able to pick up shows at the start of the next round. The Network cards can be very powerful – though again the relative value of any particular card can be different for different players due the conditions on those cards. Don’t forget that the Show cards will improve over the course of the game as there are separate decks for Round 1, Round 2+3, and Round 4+5 while all of the other cards are drawn from the same supply for the entire game. Thus, if you see a powerful Star in the first round, or maybe a Promo Ad – you may want to acquire it early and then hold onto it until you need it. We have played a few games now, and we have used all of the Network cards. There is a base deck of mostly vanilla cards – which are all decent, but not overly complicated. There are also two additional decks which can be shuffled in, the “A” deck = advanced and “I” deck = interactive. We have very much liked the A deck – many of these cards are very powerful, and make the card choice even more difficult at times. Though these cards feel stronger, they do not seem to upset the overall balance of the game because all players should have a fairly even chance at choosing them from the supply. The I deck was not received as well – the “interaction” on these cards mostly allow you to screw around with cards in an opponent’s area, and our group really prefers to have their own sandbox to play in. However, for groups that like the ability to screw around with another player’s stuff – you can add these in. Now that we are familiar with the game, our 4p games have been coming in around 90-100 minutes. There is a bit of a delay at the start of each round as all the players try to digest the 20 cards on the display (7 shows, 5 stars, 4 ads, 4 network), but once the action starts – most of the individual turns move along rapidly. Though there isn’t anything to do when it’s not your turn, I find that I spend most of that downtime scanning the board trying to figure out which of the remaining cards is best for me. The quality of the components is very good. The split scoreboard is a nicely constructed thing – and the different scoreboards for different player counts makes it easy to correctly and quickly set up the game each round. The artwork is well done, and the whimsical/satirical card titles never fail to provoke a chuckle or two when they are read aloud. They also help promote the overall theme. The ruleset is well written, and we did not find any issues in learning the game directly from the rules. 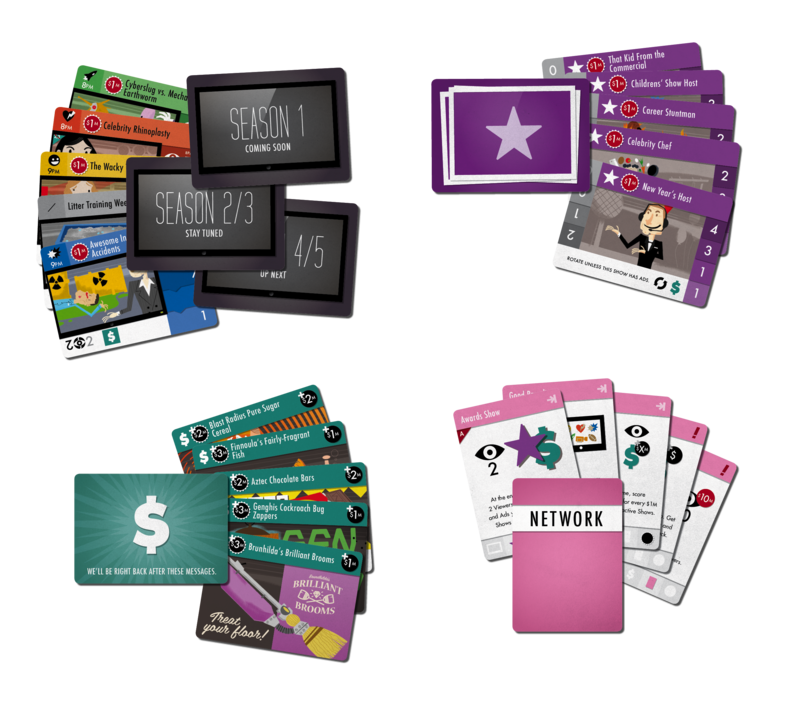 The Network cards add rules to the game, which may actually supercede the basic rules in the rulebook – and we have yet to find a card which we had issues with the rules contained in the card text. 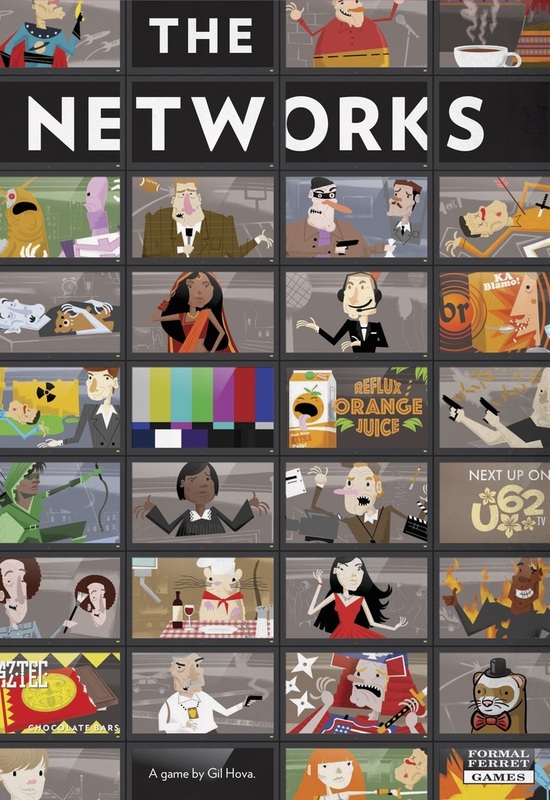 While there are no unique mechanisms in the game, The Networks is a well crafted card-drafting game. The game remains engaging throughout the entire playing time, and the escalating strength of the three Show decks gives a nice trajectory to the strategy/scoring. It has held up well over the first five plays, and while I’m still not sure whether or not this will be an evergreen in my gaming collection, that is looking like a distinct possibility. 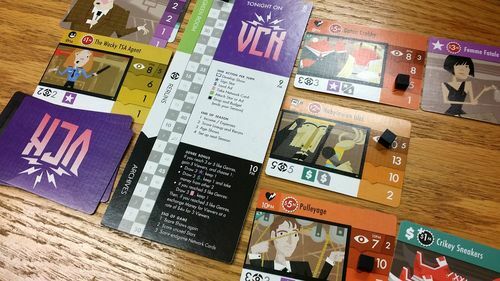 Craig V: The Networks is one of those games that doesn’t really offer anything new or try to utilize a unique mechanism, but it does do it better by offering a really good combination of things that really work well together. Theme, artwork and game flow work in harmony to set this game apart and offer an engaging game play experience full of tension, decisions and strategy. The rules are easy to teach and turns are smooth. I had fun playing and would recommend The Networks to anybody looking for a Euro-style card game that has some depth, but isn’t overly complex or lengthy. 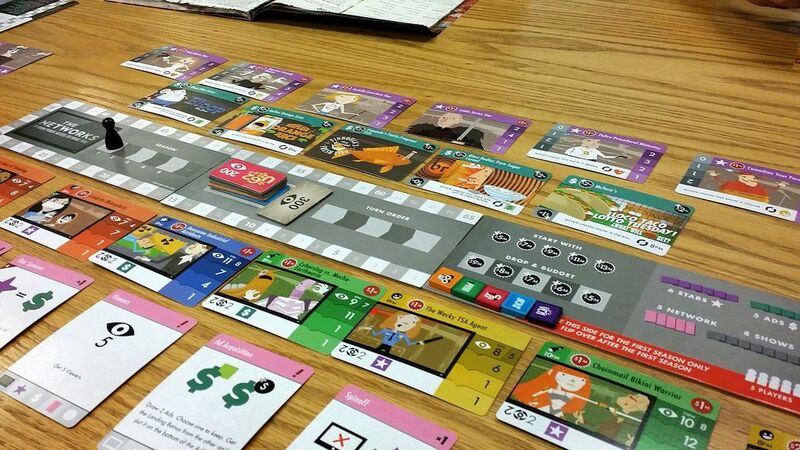 Dan Blum (1 play): I liked it overall, but the card selection seemed a bit too random – not being able to get any show of a genre or timeslot you need in a round can be a big problem given that there are only five rounds in the game. Possibly knowing the deck composition would help.